The Rev’It! Sand 3 jacket aims to tick all the boxes and provide an all seasons jacket in the mid-price bracket for around £360. 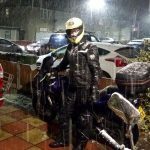 Provided for review by Fortamoto.com (the well regards Amsterdam based motorcycle store), I’ve put it through it’s paces over the last few wintery weeks in London. Read on to see if it lives up to promises. 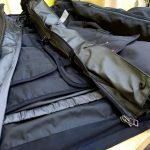 On hot dry days remove the waterproof layer and store in the back pocket for unexpected rain showers – perfect for the changeable British summer. The Sand 3 is a textile jacket with the tried and tested design of three layers, where the inner two can be removed. 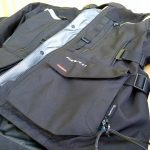 The outer layer utilises polyester ripstop, PWR shell 500D and polyester 600D across different panels, to give some initial water repellence but primarily strong abrasive protection. 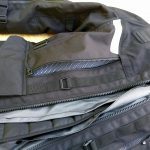 The middle layer is a removable waterproof Hydratex 3L liner, which gives full waterproof protection whilst being breathable. The third inner most layer provides thermal insulation for warmth. On top of that, you have Level 2 CE Seeflex armour on the shoulders and elbows. 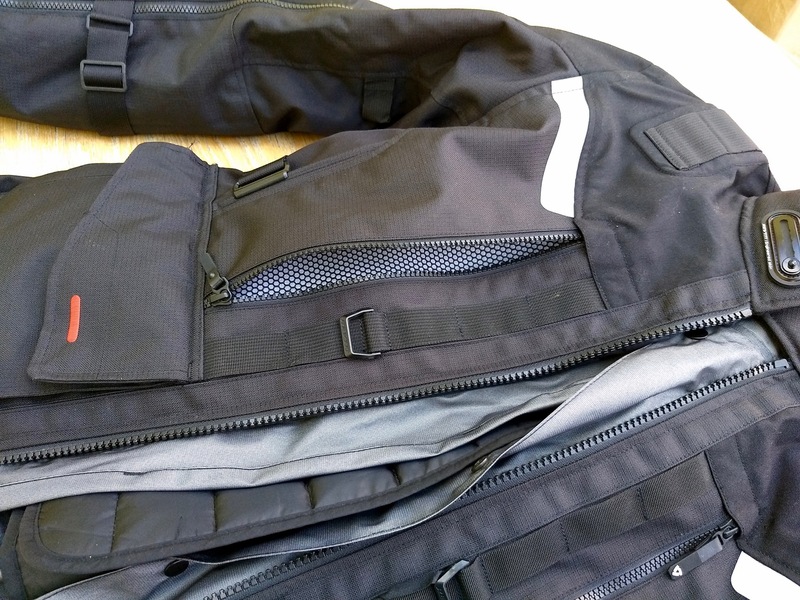 An optional back armour insert is available separately for about £35 (which I have in for this review). The philosophy is that in warmer weather you can leave the thermal liner at home, and on hot dry days remove the waterproof layer and store in the back pocket for unexpected rain showers – perfect for the changeable British summer. 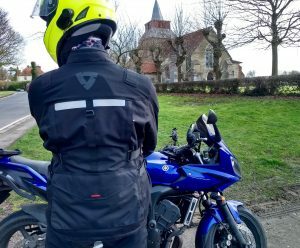 It’s clear a lot of thought has gone into the design of the Sand 3 jacket to make it incredibly versatile for use in all weathers. 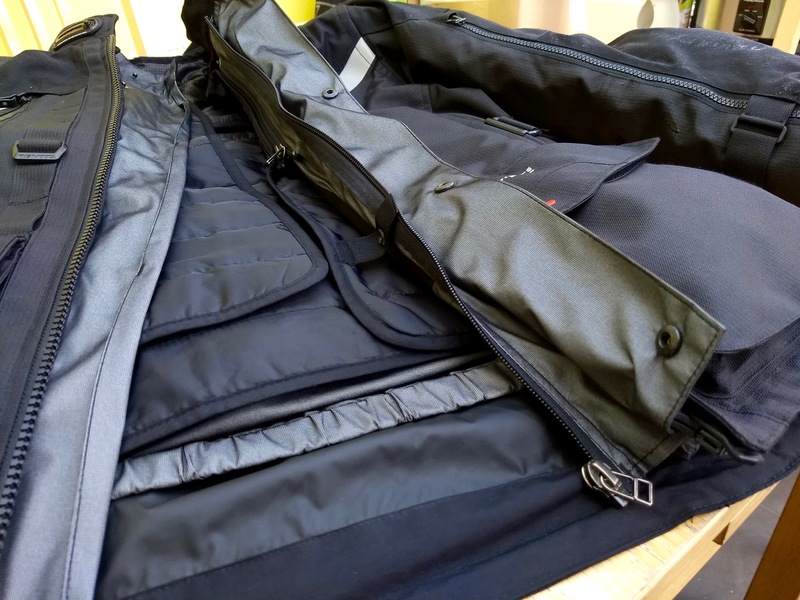 For hot days, as well as removing the two inner layers, you have zip open mesh vents front and back, and the full length of the arms to provide loads of cooling air flow. 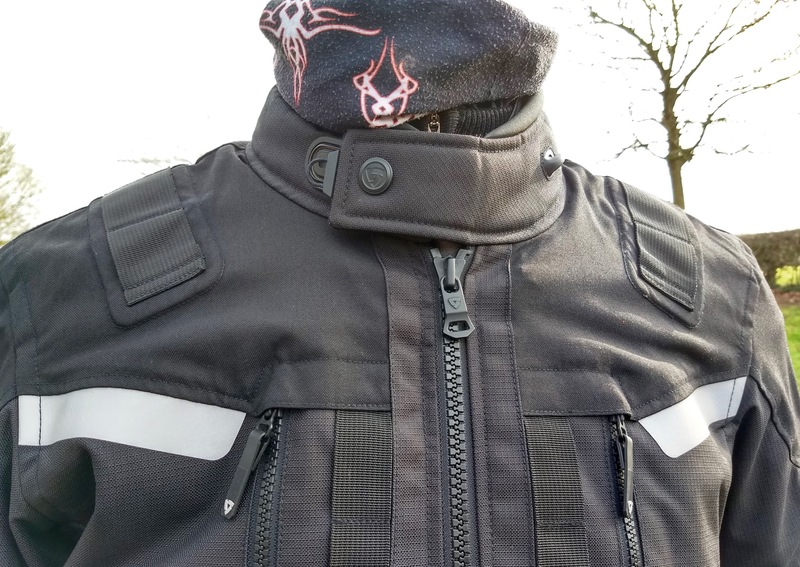 On colder days the thermal liner provides ample warmth and the neck design keeps the cold wind out. In recent rides in the wet, snow and freezing temperatures the jacket hasn’t let me down, keeping me warm and dry so I can stay focused on riding. Of course, not being a laminate design, the outer layer did soak, but not as bad as I expected (or as bad as past jackets I’ve used from Rukka, Hein Gericke etc) and it was mostly dried out by the following morning. A reasonable level of water repellency in the outer layer is helping here. 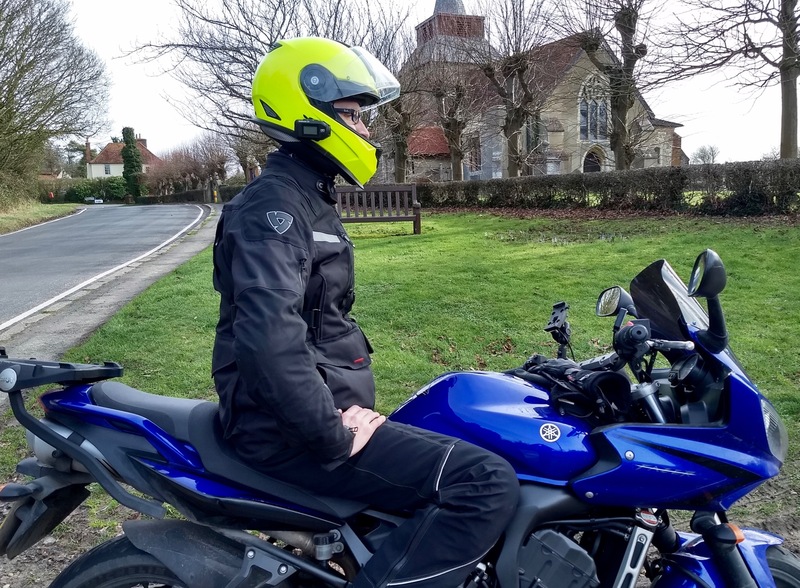 Overall, no complaints on wet and cold protection, but the final test on how it also performs in the summer will have to wait until later in the year when the weather improves. Fit wise the jacket has a longer design, coming to below the waist. It has plenty of adjustment straps to tweak the fit, even down to a tweak-able collar fastener for different neck buffs. All of which was perfect for me as a tall skinny chap at 6’1″, I usually take a UK40/EU5, roughly equating to the Medium-Large borderline in Rev’it sizes, but I opted for the Large for arm length and shoulder breadth, then pulled in all adjusters to fit my skinny frame. 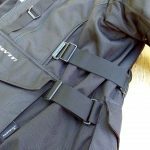 The jacket then fit well, but I did find some of the waist adjuster straps like to loosen off on their own after a while. All the adjusters are also great to pull in the fit after the inner layers have been removed. 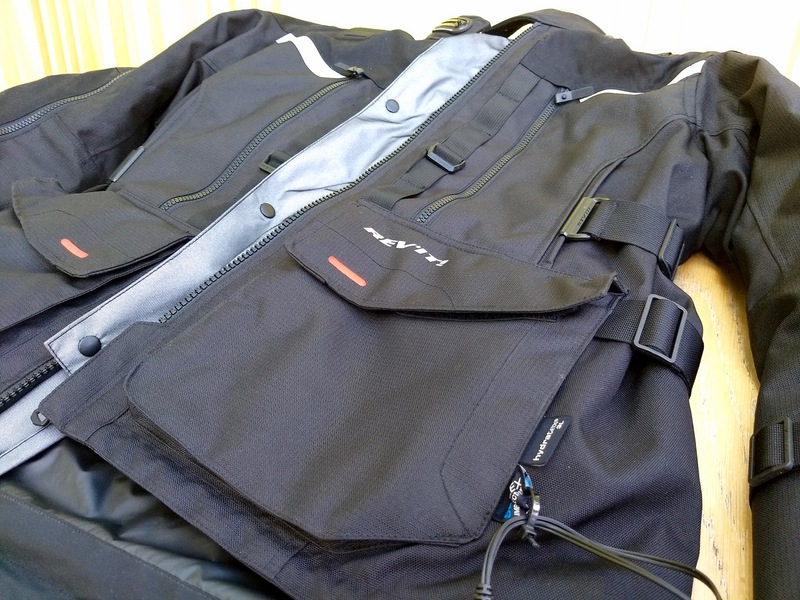 The arms are nice and long, which is a refreshing change as I find many jackets a bit short leaving a drafty gap. I found the cuffs better suited to wearing gloves underneath, the layers were a tiny bit bulky when tucked into my large gauntlet style Gerbing’s heated XR12 gloves. 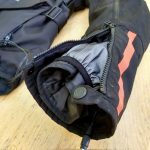 Much of this is down to the how the waterproof and thermal liners often creep out when putting on, or try to pull out when taking off the jacket. 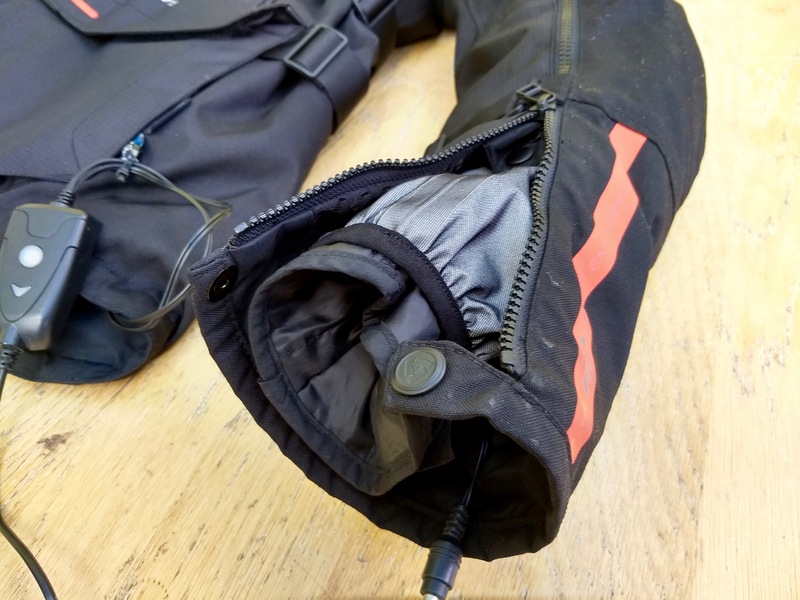 This appears to be because they’re fastened by poppers to one another giving some slack, also the thermal liner fastens with only a single popper at the wrist and the waterproof line has one popper set back further up the arm due to zip opening. 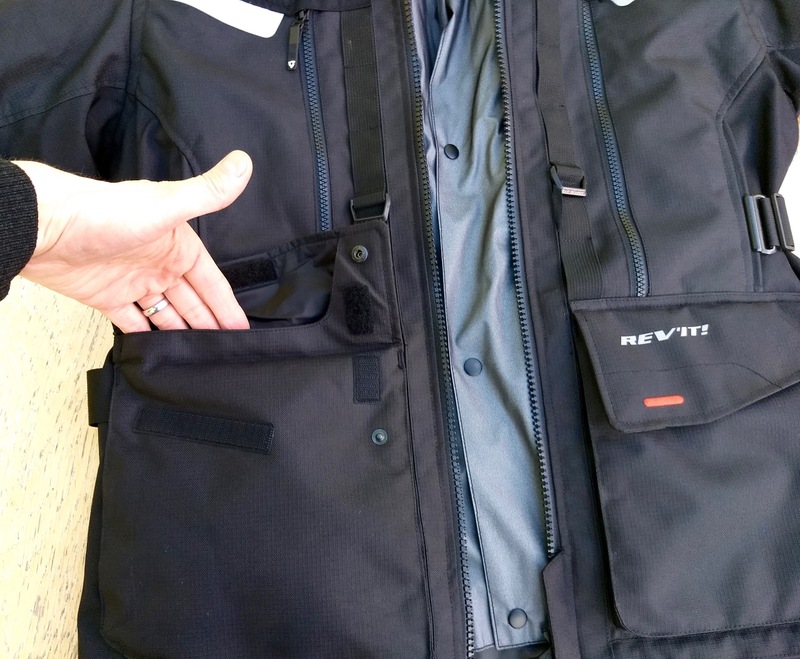 This jacket really is packed with loads of very handy features. 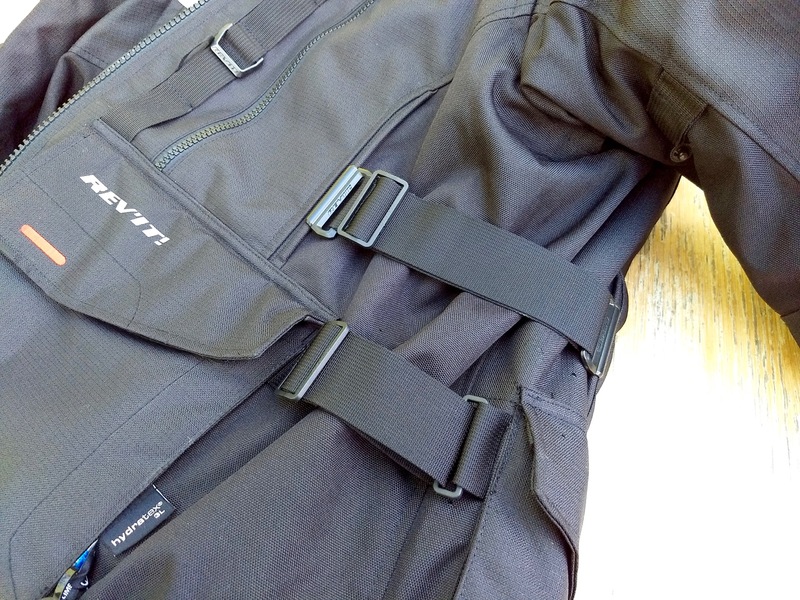 There are shoulder straps to mount a camera, neck brace compatibility, attachments for a slot in cooling vest and a hi-vis vest and HV chest connectors, seemingly a universal standard. 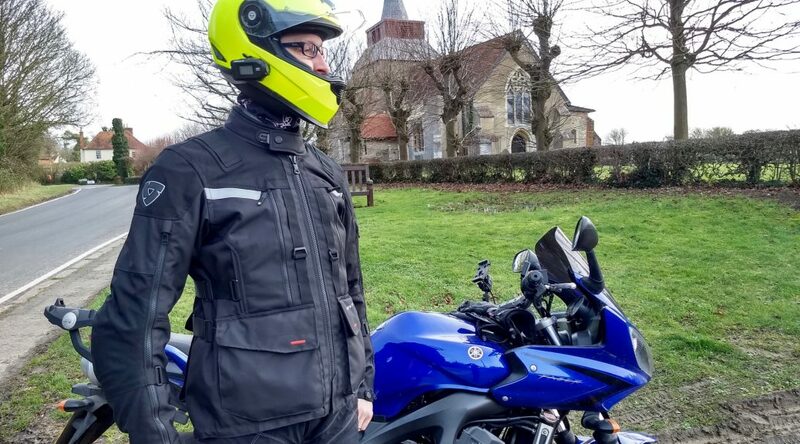 The Rev’it hi-vis (£35) would beat faffing with zipping up an additional hi-vis over the top and so will be on my shopping list. 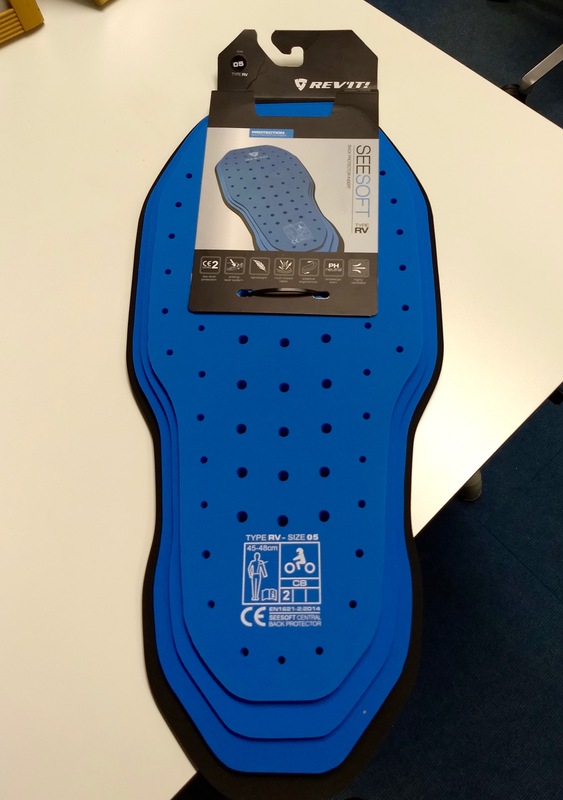 A neck brace is not something I’d consider essential for London commuting, but the option of a clip in water soaked cooling vest (at ~£60) is intriguing. 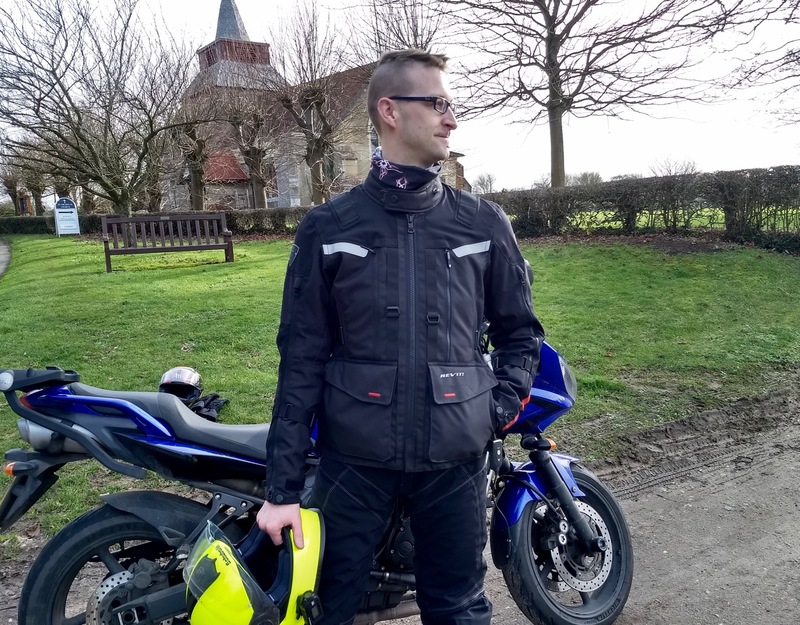 It’s clear this is a decent jacket with a lot going for it, but for me the big question is whether spending £360 on a three layer jacket is a good plan, when there are now many laminate waterproof textile jackets on the market at a similar price? 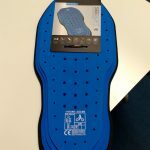 With waterproofing laminated to the outer layer you can avoid soaking out, getting chilled and the longer drying time. As such, you have to stack up the Sand 3 against the laminate likes of the Halvarssons Walkyr (£500), Oxford Mondial Advanced (£250) and even the Rev’it Horizon 2 (£310). The Mondial Advanced is a budget brand option and only includes level 1 armour. The Walkyr is quite a bit more, but does include a removable hi-vis (£35 extra from Rev’it). The Horizon 2 is surprisingly cheaper than the Sand 3, but the Sand 3 offers far more features aimed at some serious touring and adventuring. The three layer design also allows for a very cool jacket in hot weather. 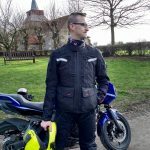 Such versatility definitely has some advantages if you need a single jacket for all seasons or plan longer touring through many different climes. So far, I’ve been very impressed with how this Rev’it jacket has performed. 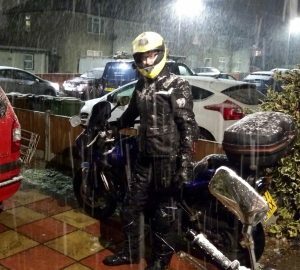 It’s held up very well on some really cold and wet rides. It’s stuffed with practical and well designed features, handy day to day and invaluable on a longer tour. There are cheaper alternative, but none with as many features at this quality level. 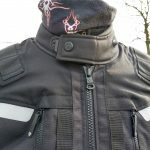 There is some compromise, with the useful pockets causing bulk that affects the look and flow of the jacket, but this is minor. 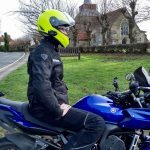 The all season versatility of the Sand 3 jacket is the big plus point, and something I’m keen to try out over the coming summer months. 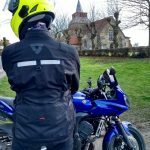 I expect it to be a very cool jacket to combat those hot days on the bike, check back here for my long term follow up review. Find out more about the Rev’it! Sand 3 jacket and other colour options at Fortamoto.com. 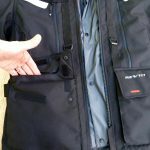 Huge front pockets and waterproof too!